You love ’em; you hate ’em. There’s no middle ground with Peeps . Don’t even ask how to eat them. Personally, I like to bite the heads off first. Peeps are the product of the Just Born company based in Bethlehem, PA – Yeah Pennsylvania! Starting in 1953, Just Born started mass producing Peeps rather than making them by hand. In the 1960’s Just Born started making seasonally themed marshmallow candies. Up until 1995, the Peeps were only made in the traditional colors: pink, white, and yellow. Today there’s at least 49 different types of Peeps ! In the Spirit of LONG LIVE PEEPS , I rounded up some Peeps fun to get you started. Of course, you should make sure you have a package of Peeps handy before checking out all these fabulous ideas. I go for yellow ones myself. Sooo…what’s your favorite way to eat a Peep? It is so true that people either love ’em or hate ’em, huh?? Funny! I’m in not a big fan camp but my husband LOVES them. We used to joke about it when we were dating – like, I don’t know how I can be with you given how you feel about Peeps… lol. Oh I love peeps in all kinds of ways! Yellow chicks are my favorite! I hate peeps but my husband loves stale peeps. So many wonderful ideas and love that giant chick! Thanks for including my DIY! So many fun ways to use Peeps! I personally like them to get a little stale…then I bit their cute little heads off! My favorite are the yellow! The cake is a-dorable! Thanks for including me in this peep-tacular round-up! I used to love Peeps when I was a kid,… probably a little too much. Wait, 49 different Peep varieties?!?! I had no idea! I love all of that factual info about them! 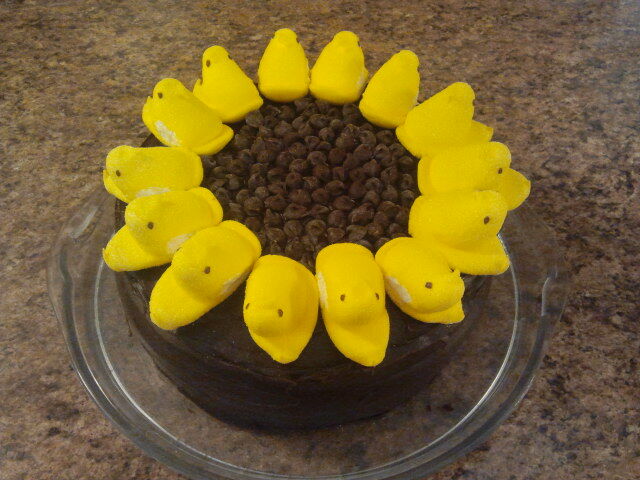 And that sunflower Peep cake…awesome! Peeps are the iconic symbol of Spring I think. I never know what to do with them , but I just have to buy them. I think Peeps are so sweet, but y kids get some in their basket.